Developmental Services | Family Counseling Center, Inc. This program provides life and vocational skills training services to intellectually and developmentally disabled individuals, age 18 or older. Our goal is to help clients improve or acquire skills needed to achieve their most possible independent lifestyle. This is accomplished by providing day habitation, which focuses on the development and enhancement of daily adaptive living skills and economic self-sufficiency. Typical activities are functional, performed at the natural time, properly sequenced, developmentally/age appropriate and are provided in an inviting nurturing environment. The Educational Center is open Monday through Friday, 9:00 a.m. to 2:00 p.m.
Service Area: Johnson and Pope counties. 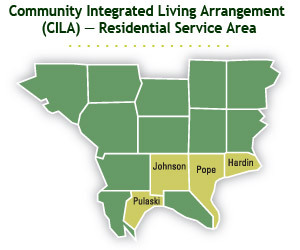 Community Integrated Living Arrangement (CILA) Residential programs provide flexible “home-like” living arrangements that focus on daily life skills for individuals, 18 years or older, who are intellectually developmentally disabled. Our primary goal is to promote client independence in a flexible, supportive living arrangement — either in the family home or a community residential setting where eight (8) or fewer individuals live together under the supervision of a licensed agency. 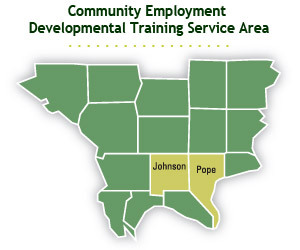 Service Area: Hardin, Johnson, and Pope Counties. 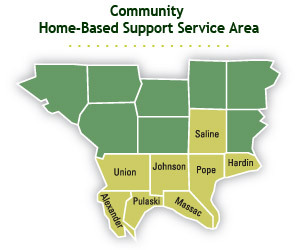 The Home-Based Support (HBS) program offers supportive staff services to adults or children with intellectual developmental disabilities so they may remain a part of their family in the local community and avoid institutionalization. Personal care workers are hired by the client to provide intermittent support services in their own home on an assigned schedule. Several clients have even achieved independent status with minimal support as a result this program. Developmental Services program, or call (618) 658-2611!